When Billy Kuch knocked on the wrong door, he had a cigarette in one hand and a shirt in the other. The homeowner, Gregory Stewart, stepped outside, stood his ground, fired a round from his semiautomatic into Kuch’s chest, and in the eyes of the state of Florida, committed no crime. Three years after that shooting, in a Land O’ Lakes subdivision called Stagecoach Village, Kuch is alive but damaged by his injuries and the shock of being shot at point-blank range. Stewart is free but lying low, still sought out by neighbors and others who want him to account for his actions. In Florida and across the country, “Stand Your Ground” laws — the same kind of legislation that authorities cited for not arresting a neighborhood-watch volunteer after 17-year-old Trayvon Martin was killed in Florida in February — have coincided with a sharp increase in justifiable-homicide cases. Prosecutors still reject many claims of self-defense under the new law, and no long-term studies definitively tie the rise in justifiable killings to the passage of laws that relieve citizens of the responsibility to back away from threats. But the Martin case has focused a spotlight on incidents in which the mere statement that people feel endangered allows them to — depending on your sense of what’s right — defend themselves against thugs or act like vigilantes. This sharp turn in American law — expanding the right to defend one’s home from attack into a more general right to meet force with force in any public place — began in Florida in 2005 and has spread to more than 30 other states as a result of a campaign by the National Rifle Association and a corporate-backed group called the American Legislative Exchange Council (ALEC), which promotes conservative bills. Florida has been at the forefront of expanding gun rights for decades, ever since an NRA lobbyist named Marion Hammer, the NRA’s first female president, became a force in the state capitol in Tallahassee. When she helped write the Stand Your Ground bill and circulated it, some police chiefs and other law enforcement officials warned that the measure would make it hard to convict people of murder — defendants would simply claim self-defense and challenge prosecutors to prove they were lying. But those concerns were heavily outweighed by lawmakers’ desire to send a message to taxpayers that the justice system would no longer consider suspect those who defend themselves against attack. In the aftermath of the 2001 terrorist attacks and amid images of lawlessness in New Orleans after Hurricane Katrina, many Floridians — and Americans generally — felt less safe and believed the justice system could not protect victims, said a study of Stand Your Ground laws by the National District Attorneys Association. In Florida, where looters appeared in the wake of Hurricane Ivan in 2004, Hammer launched her drive for the new law based on the case of James Workman, a 77-year-old Pensacola man who fatally shot an intruder who entered the trailer Workman was living in after the storm damaged his house. Prosecutors decided not to charge Workman, but many lawmakers pronounced themselves appalled that he had to endure months of uncertainty before being cleared. The Florida Senate passed the bill unanimously. These days, Democrats and Republicans alike wonder whether the law should be tweaked to give prosecutors more leeway to determine whether a shooter really was in danger when the trigger was pulled. Billy Kuch was a troubled kid. As an adolescent, he had bipolar disorder diagnosed and he’d been arrested a couple of times for driving under the influence. He drank too much, and he knew it. So when he was out at a party that August night on Golden Eagle Drive near the intersection of Gun Smoke Drive, he decided he was too blitzed to drive home. He left the party to lock his keys inside his car so he couldn’t get behind the wheel later that night. Kuch, then 23, stumbled back toward the party but forgot which beige stucco house was hosting the bash. He knocked on the wrong door, the one belonging to Gregory Stewart, a 32-year-old homeowner who did not appreciate having his wife and baby disturbed by a drunk kid after 4 in the morning. Kuch went away and texted his sister that he was totally confused about what was going on. Then Kuch found what he thought was the party house and tried the door. But he’d landed at Stewart’s place, again. This time, after Kuch turned the doorknob, Stewart told his wife to call 911. Then he grabbed his Smith & Wesson semiautomatic and went into his front yard. Stewart said he kept asking Kuch to leave, but Kuch, thinking the guys at the party were playing a joke on him, stayed. Kuch, who stands 5-foot-9, raised his hands, asked for a light and lurched toward the homeowner. Stewart fired. Stewart broke down in tears when police arrived. “I could have given him a light,” he said. But he said he had felt threatened. Police asked Stewart why he hadn’t just waited inside until officers arrived. “I don’t know,” replied Stewart. His unwanted visitor, he said, was unarmed. Kuch spent five weeks in a coma. He woke with no recollection of the incident. Before the shooting, Kuch had supported the Stand Your Ground law, his parents said. Stewart’s view of the law is not known. He did not return repeated calls, and no court ever asked, because Stewart was never brought before a judge. Kuch’s bipolar disorder has worsened since the shooting, his parents said. He is working as a chef’s assistant but has had trouble getting past the trauma of what happened that August night. “By the grace of God, our son lived, but this could happen to anyone in Florida just because you went to the wrong house,” Jeanann Kuch said. In the seven years since it was enacted, the Florida law and others like it have become an effective defense for an increasing number of people who have shot others, according to state records and media reports. Justifiable homicides in Florida have tripled, according to Florida Department of Law Enforcement data. Other states have seen similar increases, FBI statistics show. In the five years before the law’s passage, Florida prosecutors declared “justifiable” an average of 12 killings by private citizens each year. (Most justifiable killings are committed by police officers; those cases, which have also tripled, are not included in these statistics.) But in the five years after the law passed, that number spiked to an average of 36 justifiable killings per year. Neither the state nor Florida’s association of prosecutors declares the jump in justifiable homicides to be a direct result of the new law, but the state public defender’s association does draw that connection, as have advocacy groups opposed to Stand Your Ground laws. The Association of Prosecuting Attorneys, a national group, argues that Stand Your Ground is not just a technical expansion of the castle doctrine, the ancient legal concept that allows property owners to defend their homes, but rather a barrier to prosecution of genuine criminals. “It’s almost like we now have to prove a negative — that a person was not acting in self-defense, often on the basis of only one witness, the shooter,” said Steven A. Jansen, the group’s vice president. The Tampa Bay Times has identified at least 130 cases in Florida in which shooters cited the Stand Your Ground law to defend their actions; in at least 50 of those cases, prosecutors decided against bringing any charges. After her victory in Florida, Hammer, the NRA lobbyist, brought the new law to the Criminal Justice Task Force of ALEC, the conservative legislative group. The task force made the Florida law a model to be presented in every state capital. Since then, 32 states have copied at least part of Florida’s statute, according to the Association of Prosecuting Attorneys. The NRA and other conservative groups have continued to push the issue in other states, though the effort has stalled amid outcry over the Martin case. Liberal groups are targeting ALEC for its role in spreading the laws, including a protest outside its Washington headquarters last week. In the past few days, after the black advocacy group Color of Change led an online campaign urging major businesses to cut ties with ALEC, three huge companies — Coca-Cola, PepsiCo and Kraft Foods — announced that they will end their membership in the council. ALEC has sought to distance itself from the Martin case, saying it was not involved in drafting the Florida law. 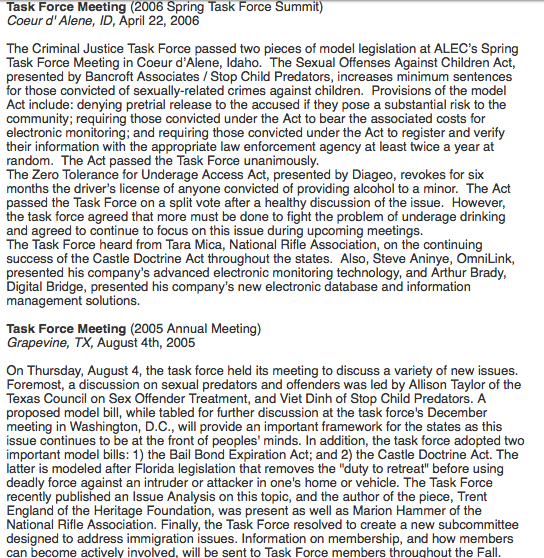 But minutes of ALEC meetings describe “the continuing success of the Castle Doctrine Act throughout the states,” and ALEC’s 2007 legislative score card lists the spread of Florida’s law as a highlight of the group’s successes. ALEC, founded in the 1970s by conservative activist Paul Weyrich, has long been the target of liberal groups who say it wields undue influence in statehouses. ALEC funders include the NRA and organizations linked to billionaires David and Charles Koch, who are key donors to many conservative groups. ALEC’s “private enterprise board” includes executives representing companies such as Exxon Mobil, Johnson & Johnson and AT&T, records show. “Using Trayvon Martin’s death in pursuit of such a dishonest dialogue is political opportunism at its worst,” she said. Thirty miles away and one year after Stewart shot Kuch, a 69-year-old school bus driver emerged from his house to shoo away a kid who was skateboarding on the neighborhood basketball court. David James, a 41-year-old Iraq war veteran who was playing hoops with his 8-year-old daughter, piped up in defense of the teenager: Where’s the sign that says no skateboarding? Seconds later, James was on top of Dooley, according to testimony at a court hearing. During the scuffle, Dooley reached into his right front pants pocket, pulled out his handgun and fired into James’s chest. James fell back. In seconds, he was dead. A prosecutor asked if James had threatened Dooley. “If you saw a bull coming at you, is that threatening?” Dooley replied. Dooley has been charged with manslaughter but is seeking to have the charge dismissed because he felt threatened and stood his ground. A hearing is set for next week. That daughter had to testify last year.